Size comparison between a standard widescreen (16:9) monitor and a (4:3) monitor. For a list of games, see games with widescreen resolution support. 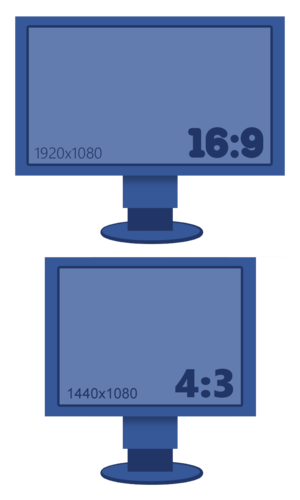 Widescreen resolutions are resolutions that are of a 16:9 (1.78:1; more common) or 16:10 (1.60:1; slightly less common) aspect ratio. The majority of computer monitors and TV's produced today are widescreen, and thus feature a native widescreen resolution. Widescreen resolutions can cause problems with older games that were built for a 4:3 (1.33:1) screen, resulting in either a stretched screen or black bars of unused screen space. Most games today will feature built in support for widescreen resolutions, while some games may require tweaking to force such a resolution. If a full-screen game is rendered at the wrong aspect ratio, the effects vary based on the monitor. Some may stretch the image, while others may instead pillarbox. Use GPU scaling to override monitor behaviour. An even wider 21:9 (2.37:1) aspect ratio exists. For more information on this, see ultra-widescreen. See the glossary page for information. Also known as widescreen behavior as it is often used to describe to how the field of view in a game changes in relation to the aspect ratio of the monitor, commonly in relation to wider aspect ratios than the game targets (so 4:3 games on a 16:9 monitor, or 16:9 games on a 21:9 monitor). The below table lists common resolutions for 16:9 and 16:10 side-by-side, as well as what they're commonly known as. An alternative way of referring to resolutions is by their vertical resolution, so 2160p refers to 3840x2160, while 1080p refers to 1920x1080. The #K standards refer to resolutions by an approximation of their horizontal resolution. So 1920x1080 is for example a 2K resolution, while 3840x2160 is a 4K resolution. 2560x1440 can be said to be "2.5K", although this isn't really a defined standard. Based on data gathered by the Steam Hardware & Software Survey. 3840 x 2160 3840 x 2400 Known as Ultra HD or 4K resolutions. For more information, see 4K Ultra HD. 1920 x 1080 1920 x 1200 Known as Full HD or 2K resolutions. 1600 x 900 1680 x 1050 1600x1000 (16:10) also exists, but 1680x1050 is more common. 1360 x 768 - Two common resolutions close to, but not exact, 16:9 ratio. 1280 x 720 1280 x 800 Known as HD, Standard HD, or HD Ready resolutions. This page was last edited on 17 January 2019, at 11:55.